It’s time for a pop quiz at Taylor King Law! What is the speed limit in an Arkansas school zone? Can you use a cell phone while passing a school in Arkansas? When are you required to stop for a school bus on an Arkansas highway? If you didn’t know the answers without checking your notes, it might be time for a crash course in Arkansas school zone laws. These laws help protect our school-aged children, whether they’re on a bus or in the crosswalk. First, let’s define the term “school zone.” What is it, and how can you know if you’re in one? A school zone in Arkansas begins 300 feet before the school building/grounds and continues 300 feet beyond it. Your city should have signs posted to clearly mark the start and finish of each school zone. Some will have flashing lights, but the following laws apply whether or not flashing lights are present. Speed Limits Near Schools: What’s the Law in Arkansas? The Arkansas Code includes a specific section on speed limits in school zones. It states, “No person shall operate a motor vehicle in excess of twenty-five miles per hour (25 m.p.h.) when passing a school building or school zone during school hours when children are present and outside the building.” Interested in reading more? Visit AR Code § 27-51-212. There are quite a few conditions listed in that statute, so let’s break it down. This law depends on two factors: 1) time of day, and 2) presence of children. If a) you’re passing through during school hours (approximately 7:30 a.m. to 3:30 p.m. in most districts) AND b) children are present and outside the building, the Arkansas school zone law is in effect. You should slow to 25 MPH once you enter the school zone (remember, 300 feet before and after you reach the building). Don’t increase your speed until you’re safely out of the zone. If you drive past the school on a weekend, or during a weekday when absolutely no children are outside the building, this speed limit does not apply. But why not use a school zone as a reminder to check your speed and proceed with caution, no matter the time of day? Cell Phone Use in School Zones: What’s the Law in Arkansas? Cell phones in a school zone? Yes, there’s a law for that. Under the Fewer Distractions Means Safer Driving Act, “A driver of a motor vehicle shall not use a handheld wireless telephone while operating a motor vehicle when passing a school building or school zone during school hours when children are present and outside the building.” View the full Arkansas statute at AR Code § 27-51-1609. Texting while driving is illegal everywhere in Arkansas, so keep your texting thumbs where we can see ‘em. Voice calls are a bit more complex: there are separate laws for drivers under the age of 18, ages 18-21, and 21 or older. Arkansas school zones, however, are the great equalizer. It is illegal for any driver, of any age, to use a handheld device (AKA: cell phone) while passing through a school zone. That includes text messages and voice calls. If you absolutely must take that call on your daily commute, hands-free devices are acceptable in school zones for drivers over the age of 18. Hands-free devices include wireless headphones or your car’s Bluetooth speaker system, which allow you to make a voice call while keeping both hands on the wheel. 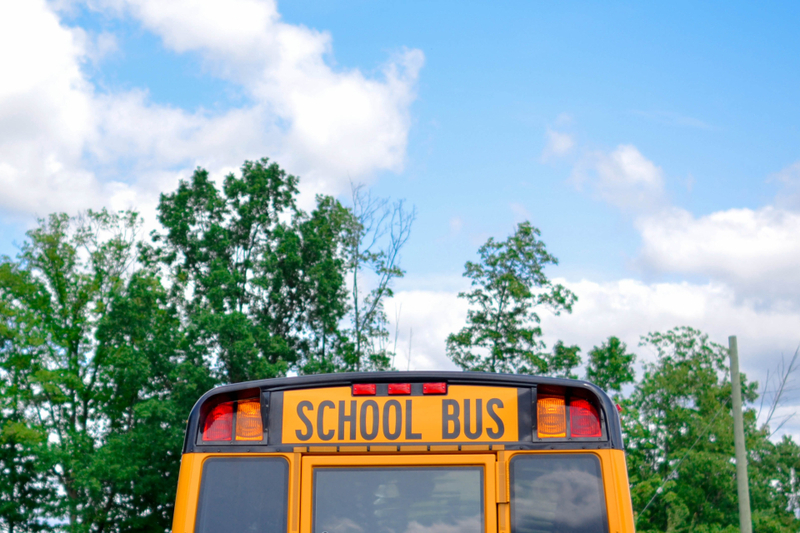 Passing School buses: What’s the Law in Arkansas? Arkansas law specifies that “When a school bus stops and displays its alternating red warning lights for the purpose of loading or unloading passengers, every operator of a motor vehicle or motorcycle meeting or overtaking the school bus from any direction shall bring the motor vehicle or motorcycle to a complete stop before reaching the school bus.” Read the full text at AR Code § 27-51-1004. Additionally, a statute called Isaac’s Law states “A person commits negligent homicide if he or she negligently causes the death of another person, not constituting murder or manslaughter, as a result of operating a vehicle … while passing a stopped school bus in violation of § 27-51-1004.” Isaac’s Law is named in honor of an elementary student, Isaac Brien, who was killed in 2004 after exiting his school bus. Negligent homicide is a Class C felony in Arkansas. What does this law mean for you? If a school bus stops and displays flashing red lights, you must bring your vehicle to a complete stop before reaching the bus. This applies to every driver coming from any direction. Once the bus begins moving again, you can, too. What about highway roads? There is an exception to this law, but it doesn’t apply to many Arkansas highways. The exception states that if the road is a multi-lane highway with a dividing strip or median, opposing traffic (driving the opposite direction) is not required to stop. A dividing strip is defined as a barrier or section in which cars can’t drive, so a turn lane does not qualify as a dividing strip. Even on a five-lane highway with a turn lane, all drivers must stop for buses. When Should You Stop for a School Bus?